Lately, I’ve been obsessed with power. No, not the megalomaniac kind. The type that powers your personal tech. My tech is always hungry. I’ve got my handy Anker portable charger for my portable tech when I’m on the road. I’ve got multiple UPS battery backups for my home office gear. I own multiple rechargeable batteries, and I always throw a twenty pack of AA’s into my cart whenever I’m at Staples. I read Facebook with envy when I see one of my friends installing solar panels on his roof. What’s going on that I crave so much reserve power to keep the digital wheels turning? I’m always feeling like the orphaned Oliver. Like it or not, AC and DC energy is the food to sustain your digital life. Certainly last fall’s Hurricane Sandy was a huge wake up call. It decimated the Northeast and knocked out power for weeks. Mother nature reminded us how fragile our power grid can be. When Sandy blew by, my house went dark for the better part of a week. The inside temperature dropped into the low forties. My family and I escaped and stayed over with friends who own a portable generator. It kept their house fully operational. Sure, there was heat and hot water. Charging stations for portable devices- All you can eat. It was like living in an alternate reality bubble. The only clue we weren’t in Kansas anymore was the hum of the portable generator sitting in the driveway. It’s taken me five months to follow up on that decision, but I’ve finally taken the first step. Mr. Electrician, I have a job for you! you need to do some electrical work. Certain intrepid souls with some electrical skills have been known to do their own electrical jury-rigging. It’s called ‘backfeeding,’ which refers to connecting power from the generator directly back into a house outlet. This is extremely dangerous, and the web is filled with warnings about how you can electrocute yourself and others down your power grid. I’m generally not into death and mayhem. And I don’t fancy myself an electrical MacGyver. So I passed on the backfeeding idea. 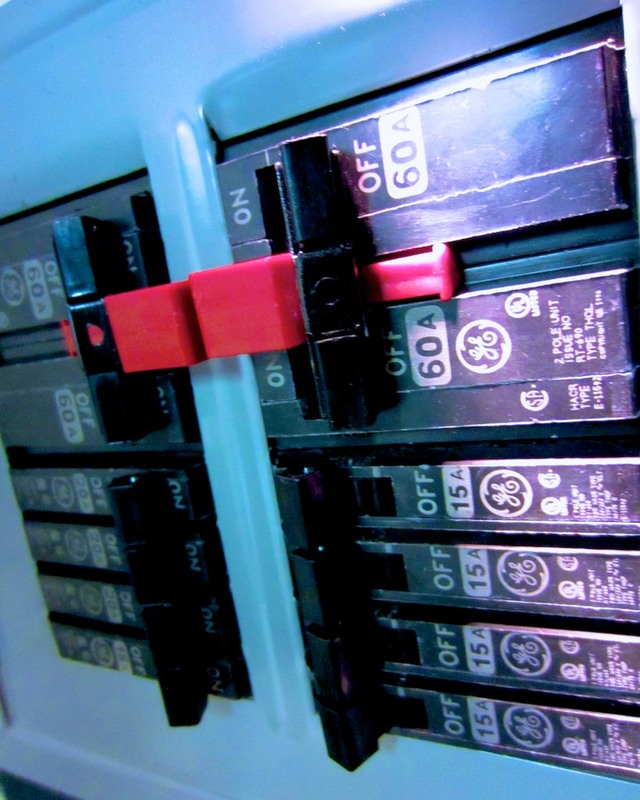 Hire an electrician to properly install a manual transfer switch next to your house’s electrical panel. And that’s what I just did last week! This additional power panel allows you to safely use and switch between your power sources. My electrician also ran a weather resistant 30-amp plug to the outside of my house for the generator. The whole shebang is not inexpensive. I spent over $1,000, doing it the right way with my electrician. But you do what you’ve got to do. So my house is finally ready for action. Time to buy the portable generator! Some portable generators are beefier than others, and yes, you pay more for the extra watts. 5,000-6000 watts should be sufficient to handle most of your home’s basic needs. Sure, you can permanently install a permanent home standby generator in your backyard, but that kind of project comes at a much higher price point. Of course, there are lots of brands to choose between. Consumer Reports likes Troy-Bilt, Honda and Generac. My electrician let me know he’s also partial to the Generac line of generators. So I focused on that company. The portable generator market today is flooded with gas generators. Yet, everyone I’ve talked with agrees gas generators have several major drawbacks. You’ve got to store many gallons in your house to keep the generator going. Yes, it’s like what you use to run your gas grill. There aren’t many LP portable generators out there, but my informal survey suggests they’re the superior choice. My friend is a strong liquid propane proponent and he quickly convinced me of the wisdom of LP. Which Liquid Propane Portable Generator? You can buy my friend’s Sportsman GEN7000LP portable generator on Amazon for $1,000. It’s clearly a solid choice. But after doing my own due diligence, I like the brand-new Generac LP5500. Generac talks about its ‘breakthrough’ research bringing propane generators to the market. In 2011, they successfully experimented with their small LP generator (LP3250). Now they’ve built a larger version, the new LP5500 (model #6001), which will start shipping in the next few weeks. 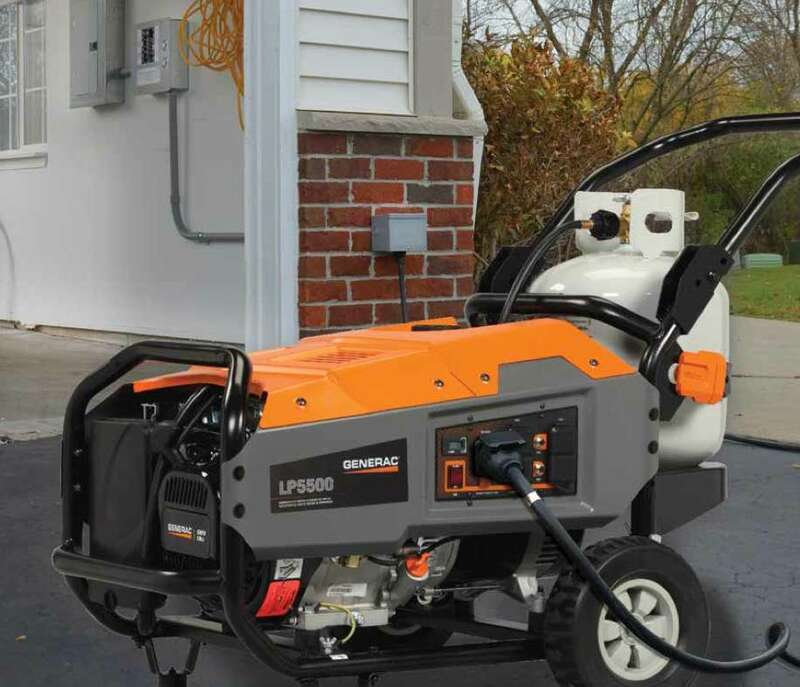 The brand new Generac LP5500 propane powered portable generator is here! It offers 5,500 running watts and 6,850 starting/surge watts. The going price around the web is $800. It’s a relatively small unit with room in the back to hold your LP tank. It has two cushy wheels for easy transport, and it’s powerful enough to play in the big leagues with its competition. Consumer Reports recently posted a video report from the 2013 Home Show featuring the introduction of the LP5500. Their video provides a great visual overview of this model. So even though I normally like to wait to read multiple customer reviews before making a decision, I’ve already got a gut feeling that this yet-to-be-released generator is the one for me. Again, as of this post, the LP5500 isn’t in stores yet, but websites are already selling it as a backordered item. They suggest they’ll have it sometime in April. The next super storm could be around the corner, so I’m feeling it’s a wise choice to pull the trigger now and get in line for this one. My electrician suggested buying from an online company called Norwall. But they’re not listing my Generac yet. Another online retailer, Electric Generators Direct has it listed and backordered for amost a month. I called them to check them out, and the representative I spoke with seemed very nice. But I don’t know the company. But the page lists a shipping ETA from 1-3 months. Then I noticed this week Home Depot has the LP5500 on its website. Backordered only for another week. Ships 3-6 days after that. So I’m planning on doing the deal with Home Depot. But before I buy my orange Generac, I thought I’d first share my own research through this post and ask if anyone out there wants to challenge my decision on the LP5500. Really, it’s less of a decision than an educated guess. I should also mention a major reason I’m not taking the proven path by going with my friend’s larger Sportsman is I’m simply looking for a more compact unit to store. So now, I’m moonlighting as my own power company to ensure the survival of my tech beyond a regional or global blackout. Maybe I should just connect the plug into the back of my skull to feed my electronics, like in the movie. That’s why the entire human race had to be enslaved to power the endless whims of technology. I wish you a successful and safe journey in your search for your own watts! I’m an electrician so I’m glad to see you advise people against going DIY! It can definitely be hugely dangerous if you don’t know what you are doing. What kind of runtime do you get on that Generac? I’ve only used the smaller Generac GP2200i. So, how was your experience once the generator arrived? It arrived in perfect shape and is now ready to go! Thanks. Are you using a switch to enable you to run your house circuit? I’m debating whether that’s useful. Also, can this store 30 lb tank? Yes, my electrician installed a transfer switch, which is the ‘right way’ to connect the generator into your house. And yes, the Generac LP5500 can use either a 20 or 30 lb tank.